Decorating an old New York City apartment can often be a very daunting process. If keeping up with he historical integrity of the building and or the apartment is a priority then it can be even more of a challenge. Luckily in this blog post we will assist you in various ways you can contribute to the vintage feel of your aged and nostalgic NYC apartment. We will list a range of decorative items and concepts that will ultimately create this vintage atmosphere that you seek. If you’d like to take a closer look at the decorative items below, feel free to click on the images as it will bring you to our online store where these items are currently being sold. If you have any questions please feel free to ask below! How amazing do these vintage maps of New York City really look! Talk about beauty, history, nostalgia! A framed vintage map poster of NYC should be considered as on of pillars of creating historical decor in a Manhattan apartment. Guests and family members will be mesmerized by the historical beauty of these vintage relics. 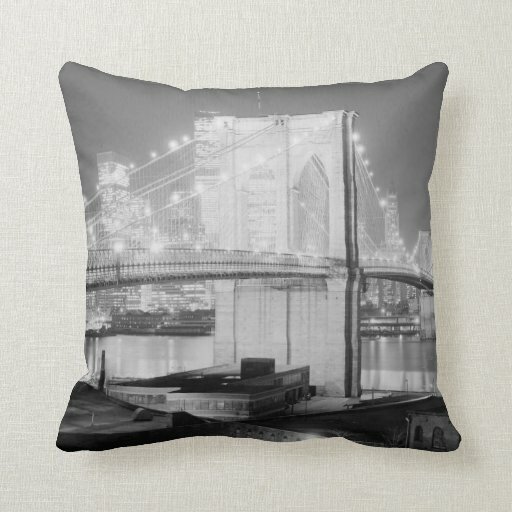 A throw pillow, especially one sporting a black and white photograph of the Brooklyn Bridge at night will not only create an iconic decorative feel to a desired room, but will also contribute to the historical feel of a domicile. The Brooklyn Bridge is recognized as one of the most prominent historical cornerstones of NYC history. It’s structure is over a century old and still has several of the engineered facets still intact. The throw pillow itself can be used to decorate a bed, a couch, even a window nook. Ya we went back with the vintage maps, this time though on shower curtains. Firstly I would just like to say that it is my belief that shower curtain designs are the singular item that stands out the most in ANY bathroom. Largely because it covers a huge surface area and allows the owner to express him or herself very easily in terms of the relative decor. 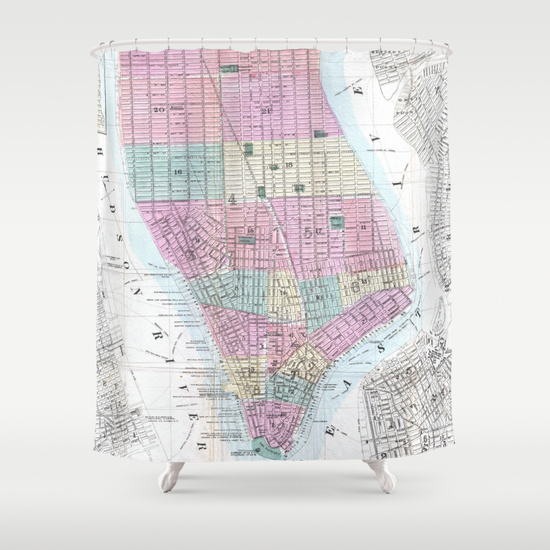 The map designed and featured on the shower curtain above is that over lower Manhattan and features the many wards of NYC. I love this design as it also features a white background and would be great for a bathroom that gets tons of light and or has white backgrounds as well. We went with yet another vintage map, but this time we changed it up with a vintage map of the world. Old world maps just give off the decorative vibe of nostalgia and history. They look good and when lit up they look even better. These lamps are great for end tables in a living rooms, offices, studies, bedrooms and much more. We’ve done full circle I believe with wall art, as we’ve made our way to wrapped canvases. A wrapped canvas is great as it protrudes from the wall and displays material that is eye popping really. 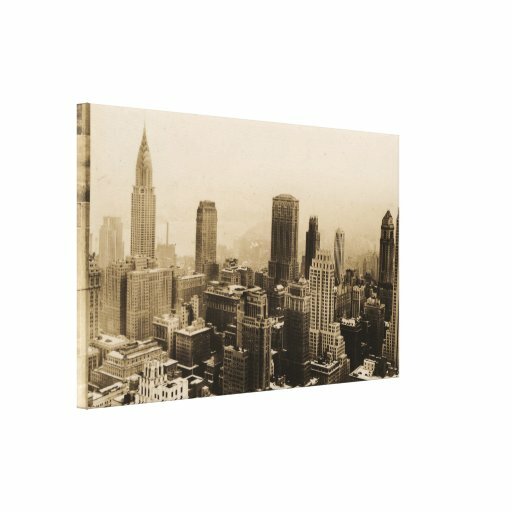 On the design above we have a vintage photograph of the NYC skyline presented before us. Skyline photographs of any city are amazing, but there is something about the NYC skyline that is just simply iconic. A wrapped canvas like this one would be perfect for a bedroom, living room, study or anywhere in which you need more wall art. 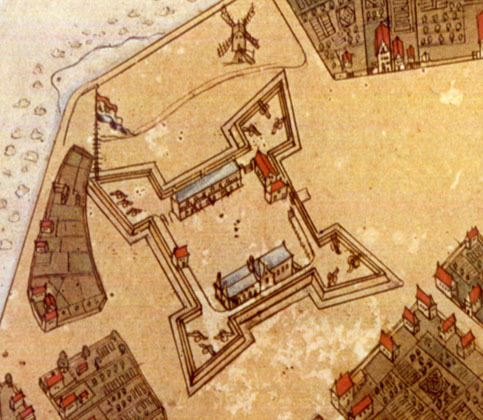 In this post we will be examining various historical photographs of Castle Garden in NYC. After each photograph we will give a title to the image as well as a publication date. Below that information we will also provide a brief synopsis of what is contained and displayed in the photograph itself. If you have any questions or comments about the material please feel free to leave them below. Interesting photograph of Castle Garden as it displays one of the entrances into the main immigrant depot. We know that this is the depot largely because “Castle Garden” is written in huge text on the front of the building. What I really like about this historical photograph is the various people displayed infront of the building itself. From the looks of it the people range from immigration officers to actual immigrants. It also appears that this photograph was taken either during the late fall or winter as the trees infront of the building have no leaves. The publication considered to have been taken in the later part of the 1800’s, but we cannot confirm that. The only thing we can confirm is that Castle Garden was in operation from 1855 – 1890. If we look at this photograph we obviously can see the Castle Garden immigration building (the same one in the previous photograph). What’s interseting about this photograph is that there is practically nothing around the main building, leading me to believe that this photograph was taken in the earlier years of operation. This photograph was used in a publication titled the “The Kings Handbook of New York City” – 1893. We know that Castle Garden stopped operation in 1890, so this is obviously a photograph from a previous date. A wonderful panoramic photograph we have in our collection that displays Castle Garden off in the distance as well as the surrounding buildings and areas. If you look really really far into the New York City Harbor you can see the statue of liberty. I really like that you get to see a side street next to castle garden in which you get to see the nearby businesses and horse and buggies. Based on the park in the foreground of Castle Garden I can only assume that this photograph was taken in a late spring, summer or early fall time period in 1902. We have another aerial photograph of Castle Garden and the NYC harbor, again like the last one it was taken in 1902. In the far distance of the harbor you can see the Statue of Liberty a little better. You can also see the various ships throughout the harbor. Based on the steam coming from the boats and buildings and the leafless trees around Castle Garden I’m going to make the assumption that this photograph was taken during the winter months. 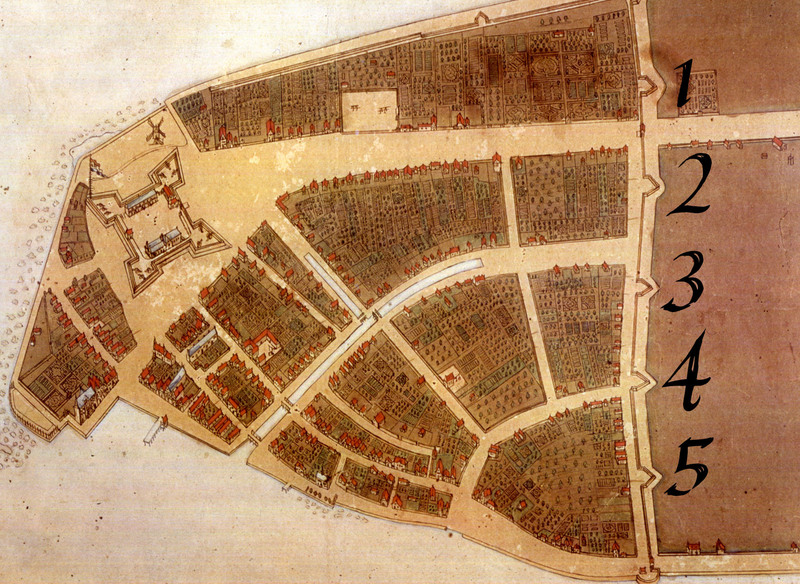 If you would like us to find more historical photographs of Castle Garden or other parts of New York City please leave a comment below and make a request! In the year 1666, when the sleepy residents of Harlaem were comfortably settled and enjoying life around their immense fireplaces, with long-stemmed pipes in their mouths, and all accustomed to going to bed at four o’clock every afternoon. Someone made the startling announcement that beyond the broad river that flowed past their doors was to be found the most beautiful farming land imaginable, just the site for their favorite “boueries”. This was enough, for once they hastily rose to the occasion. They must have a ferry at once to carry them across to those fair shores where their “boueries” were to be. The site selected was about 126th street and the East River, where the old “Harlaem Road” terminated. The peculiarly slanting and irregular boundary lines, which even to-day are found in this section of Harlem and which are so at variance with all existing streets and avenues, and form such a bete-noir alike to title-searchers and surveyors, is lasting evidence of the former existence of this early highway. A ferry meant a ferryman, and in 1667 Johannes Verveelen was duly installed, along with an African American man by the name of “Matthys”. He was allowed to furnish food, drink and lodgings to the weary wayfarers he ferried across, but not a drop to the indians. “For every passenger, 2 pence silver or six pence wampum; for every ox or cow that shall be brought into his ferry-boat, 8 pence or 24 stivers; and cattle that swim along over pay but 1/2 price. Hey everyone! Just wanted to share our newest Youtube upload which explores and examines various old photographs relative to Ellis Island history. If you have any comments or questions please don’t hesitate to leave them below! In this post I just wanted to include some great photographs in our collection that Illustrate the nostalgia of Ellis Island and New York City history in general. We will not only list each photograph, but we will also describe and examine of the subject matter and how it relates to Ellis Island and New York City Immigrant history. Also all the images and links are clickable so if you wish to download the image feel free to do so. If you have any questions please don’t hesitate to leave them below! An interesting photograph showing a boat launch station at Ellis Island. If we look closely one of the riverboats is labeled with a name that reads “W.M. Flectcher”. Obviously in the background of the photograph we see the main terminal building for arriving immigrants to Ellis Island. In this photograph we see several immigrants arriving to Ellis Island with suitcases and various packages. From what it looks like there are 2 immigration officers in between the arriving immigrants that are directly focused on the camera. A 3rd officer is to the right of them but seems to be more focused on the arriving people. In the background of the photograph you can see the various buildings that comprise Ellis Island . This photograph seems to be sporting the arrival of several smaller ships to Ellis Island. What I think is cool about this photograph is the American Flag that hangs on the back of the ship in the foreground. Notice anything different about that flag? Well it seems that it’s missing about 37 stars on it and contains only 13. The number 13 I believe is in direct accordance with the original 13 colonies of America. Anyways besides that you get to see a few buildings and structures that are on Ellis Island as well. Oh Boy! I love this photograph as it gives us a nice collage of several aspects of Ellis Island. The middle photograph details the main immigration station on Ellis Island. Now you might ask yourself, “Well it looks different than the structure now?” That’s because it is different, the one presented in this photograph was destroyed by a raging fire in 1897. Unfortunately during the fire many of the records were lost for good. Other parts of the photograph show a detention center, a dock landing area, a dining hall and the house of a Surgeon. This photograph I think is very iconic in terms of the achievement of the American dream. The photograph above displays several immigrants walking towards the boats that will deliver them from Ellis Island directly to New York City. In the photograph we see the immigrants holding numerous packages and suitcases as they ascend to the boats. We can right off the bat tell that we’re near the docks because to the left of the photograph we can see a life preserver hanging on a wooden beam that reads “Ellis Island”. If we look towards the background and more specifically to the right we can see an Ellis Island immigration officer watching the crowd as it arrives to the boats.